OHSWEKEN, Ont. (August 3, 2018) – An action-packed night saw 131 cars sign in at Ohsweken Speedway across four divisions, including 25 Late Models, for Bradshaw Brothers Emergency Services night on Friday, August 3. The night honoured all first responders and emergency services workers for their bravery in the community with free admission. 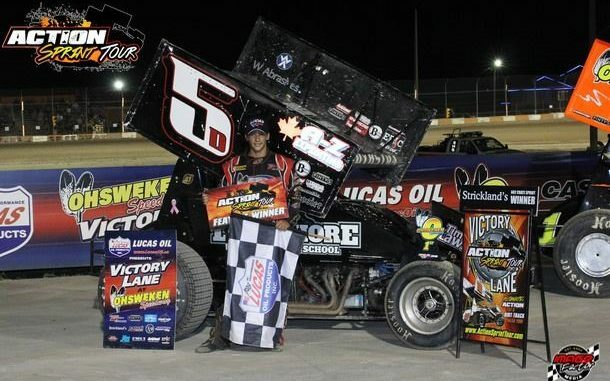 After the final checkered flag had waved, it was Jacob Dykstra who grabbed his second straight Action Sprint Tour win. For the stock cars, Rob Pietz claimed a thrilling win in the Open Late Model main event, while Christopher Hale won his first career Middleport Mechanical Thunder Stock Feature. Matt Nuell and Kyle Wert collected checkered flags in a pair of HRW Automotive Mini Stock Features. The Action Sprint Tour powered by RaceRivalz.com was making the second of three appearances at Ohsweken in 2018 and had 30 cars locked in for competition. For the 20-lap Feature it was Jacob Dykstra and Holly Porter who led the field to full speed. Porter jumped out to an early advantage, but Dykstra stayed close as the two drivers raced away from the pack and into traffic by lap seven. On lap nine, the field was reset after a caution for a spun Brad Herron in turn four. The restart saw Porter lead Dykstra, Matt Hill, Shone Evans and Liam Martin back to green. Dykstra again stayed with Porter and on lap 11 took the lead in the outside lane with a good run down the backstretch. The top two again stormed away from the field while Evans got around Hill for third on lap 13. The second and final caution of the race came on lap 15 for debris in the racing groove in turn four. The restart proved no problem for Dykstra though, as he raced to his second straight win with the Action Sprint Tour. It was also the third overall victory this season for the Port Colborne, Ont. teenager. Brandon Murrell, Holly Porter and Hannah Ferrell collected heat race wins to begin the evening while Jerry Hill won the B-Main and claimed the 19th starting spot for the Feature. The ultra-competitive Middleport Mechanical Thunder Stock division saw Ryan Dinning and Brian Teeple lead the field to the green flag for the 20-lap main event. Neither driver could gain an early advantage as fifth-starting Billy Bleich Jr. raced forward to the point on the opening lap. Bleich paced an eager group of drivers that shuffled the front row starters back quickly and resulted in 12th-starting Christopher Hale and sixth-starting Ken Sargent locked into a battle for second. Hale prevailed in the battle while Bleich led a four-car breakaway that also included Sargent and Blake Bomberry Jr. The race saw three consecutive cautions on laps 10, 11 and 12. Hale made the most of the first restart and drove to the inside of Bleich, who had chosen the outside lane, in turn one and drifted in front of him to claim the point. He then held off Bleich on the lap 11 and 12 restarts and again following a lap 16 caution. Hale was able to sneak away in the final laps to his first career Ohsweken Feature win as Ryan Beagle wrestled the second spot away from Bleich. Point leader Dave Bailey earned the hard charger award with a drive from 18th to fourth and Sargent rounded out the top-five. Bleich, Hale, and Trevor DeBoer took heat race victories to begin the night while Jason Lungaro won the B-Main. The HRW Automotive Mini Stocks were in action for a pair of Feature races as they started the night with a make-up Feature from July 20. It saw Jason Dixon and Paul Longboat make-up the front row with Longboat grabbing an early lead. Jon Janssens raced forward from 12th to take the lead on lap four while 16th-starting Matt Nuell battled with Dixon for second as Longboat got shuffled backwards. The only caution of the race came on lap nine when Sean Iftody came to a stop at the top of turn four. On the restart, Nuell was able to use the outside lane to drive to the outside of Janssens and drove away over the final six laps to score the victory. Mark Bazuin stole the second spot at the finish while Janssens settled for third as Dixon and Nick Masi rounded out the top-five. In the second Mini Stock Feature of the night, it was Mike Giberson and Daniel McKay who paced the field to the green flag. McKay grabbed an early lead but was quickly reeled in when Sean Iftody spun in turn four. On the restart, Kyle Wert drove to the lead in what turned out to be the winning pass. A trio of cautions through the middle portion of the race forced Wert to be strong on several restarts as he had to contend with Nick Masi. The top two broke away from the rest of the field in the closing laps, but Wert held on while Masi scored the runner-up finish ahead of point leader Gillian Hils, Tristan Da Silva and Fabio Olivieri.